Discussion in 'Archive' started by Yumi, Oct 24, 2018. Now authorization on the 4game platform occurs only through the interface of the New 4game. In this topic you will find a variety of solutions to common errors and get answers to the most popular questions about the New 4game. Problem: an error occurs when you try to enter your account through the 4game (Internal error, http response has text…). Solution: Use your email address instead of login. If the problem is still actual, try to sign in through the site. Problem: in a second after signing in the launcher you are thrown back to the authorization window. Solution: Re-enter login and password manually without using a saved session. Question: I used to enter the game through the website, how can I specify the path to the game for the launcher without reinstalling? Answer: Click the “install” button in the upper right corner of your screen. 4game center will find the game on your computer itself and will update it to the latest version. If for some reason the game isn’t found automatically, then specify the path to it in the appeared window. Question: How to make a quick switch between the accounts? Answer: you have to exit the current account using Alt+Q, then go to the previously saved account or enter a login and password for the new one. Question: Do I have a possibility to enter the game with several accounts at the same time? Answer: You can not do it at the same time, but you can make a quick switch between the saved accounts and log in one by one. Problem: During installation on Windows 7, 4game launcher center pops up the message “program has stopped working”. Solution: Install the Windows KB4019990 update, using the following link. 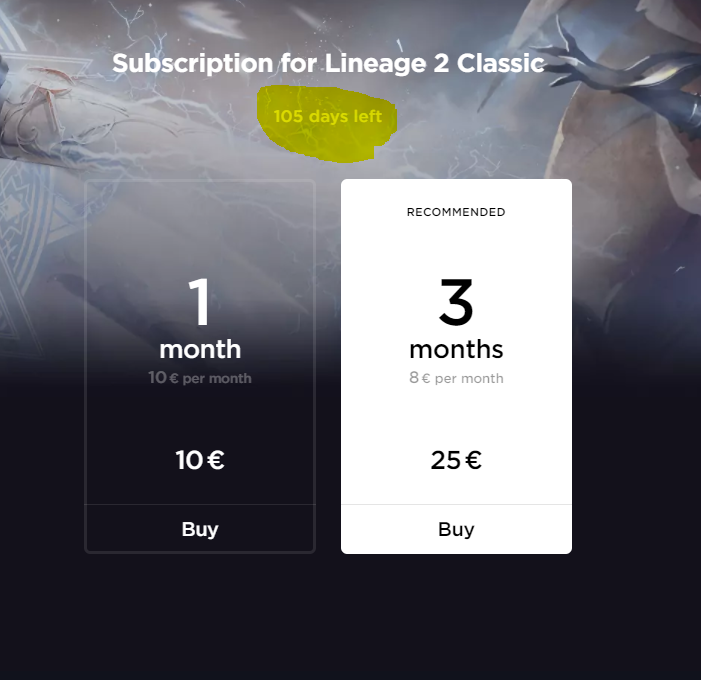 Question: Where in the 4game launcher can I find information about the number of remaining days of subscription in the Lineage 2 Classic? Question: I don't remember/lost access to email or phone number connected to my account, so I can't enter the confirmation code. • All emails and phone numbers, connected to the account at different times. • Screenshots from the payment system or scanned checks of the oldest payments (over 3 months). Screenshots of letters with payment alerts from the 4game are not suitable. • Links to all social media pages, connected to the account. • The approximate date and town of the account registration. • Full name (as stated in the account) and document number (the series and the last 2 numbers), if they are specified in the account. • Character nicknames and their servers. • List of blocks (if you had them) with the approximate dates and reasons for blocking. • An estimated date of last log in to the account. This topic will be complemented with typical questions and problems. You can also see it when clicking "Extend Subscription"
Sometimes the system request a confirmation code (SMS or mail), when user logs into an account by the website. Why does it happen? When you log into the account with help of the website, the system always requests a confirmation code, even if a user added to the computer to the trusted list. When you log into the account by launcher for the first time, the system asks for a confirmation code. The computer will be automatically added to the trusted list after entering the code. But if you mark “don’t remember me”, the computer will not be added to the trusted list. After that the system will not ask you for a new confirmation code anymore. You can add only 5 computers to the one account. If you try to add a 6th computer, the 1st computer will be deleted and the system will ask a new confirmation code . We recommend you to use the launcher to enter the game. This way allows to decrease the number of quantity requests for confirmation codes. AquaMarine and Ptitlaby like this. Thank you for patience and apologize for the inconvenience. Добрый день. В последние несколько дней у нас наблюдались технические проблемы с оправкой сообщений от Службы поддержки на почту пользователю. Пожалуйста, продублируйте ваше обращение или ответьте на это - в том случае, если ваша проблема все еще актуальна. Приносим извинения за долгое ожидание. С уважением, Служба поддержки 4game. Here's the catch. The third answer : "We only accept appeals in Russian". Служба поддержки рассматривает только обращения, написанные на русском языке. Уточните, пожалуйста, чем мы можем вам помочь? From the last two emails, the first feeling which came to mind was "We don't really care". As far as the exact procedure hilighted in this post was followed. Is there anything else which should be done ? Should we write all our emails to ru.support@4game.com in Russian since you mentionned the email in your post ? Can we somehow make more then one desktopicon for diffrent acoounts with different logindata ? I have a few question, I see you can change accounts but can you still 2 box ? 2 accounts the same time ? Also if I pay for a month can I add 3 months after ? or do i have to wait for the month to run out ? My 4game app dont work now, some others have same problem?